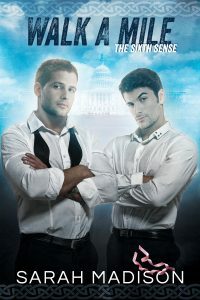 Unspeakable Words on Dreamspinner Press: Special Agent John Flynn is everything Jerry Parker is not: dangerously handsome, coolly charismatic, and respected by his peers. 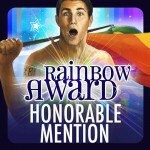 Parker is assigned to work with Flynn and the sparks fly as their investigative styles clash. A chance encounter with a strange artifact changes everything, however, and the two men must learn to trust each other before a killer strikes again. Book One in the Sixth Sense series. 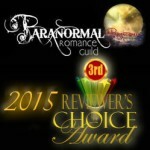 The Sixth Sense series was awarded 2nd place for Best M/M Mystery Series in the 2014 PRG’s Reviewer’s Choice Awards, and third place for Best M/M Paranormal/Urban Fantasy series in the 2015 PRG’s Reviewer’s Choice Awards. Walk a Mile (Book Two in the Sixth Sense series) from Dreamspinner Press: Six months after starting their hunt for a serial killer who is still at large, FBI agents Jerry Lee Parker and John Flynn are partners in every sense. But Jerry has serious doubts about their relationship and whether they would even be together if not for the way Flynn changed after touching a mysterious artifact in a museum. Flynn hates the extraordinary power bestowed on him by the artifact and wants nothing more than to have a normal life again. Jerry fears that without the unusual connection they forged, Flynn will no longer want or need him. Chasing after a similar artifact takes them back to Flynn’s old stomping grounds in Washington D.C., where his newfound abilities uncover long-buried secrets, the kind people would kill to protect. But they aren’t the only ones looking for these powerful relics, and what they discover will threaten their relationship—and their lives. Book Two in the Sixth Sense series. An All Romance Bestseller! An October 2014 Recommended Read from Prism Book Alliance. Third Place in Best M/M Mystery in the 2014 Paranormal Romance Guild’s Reviewer’s Choice Awards. 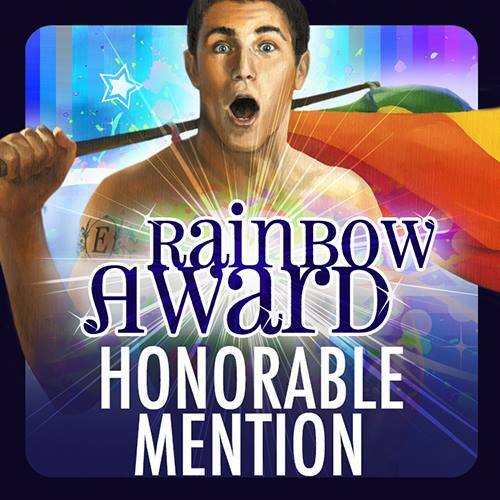 Honorable Mention in the 2015 Rainbow Awards. 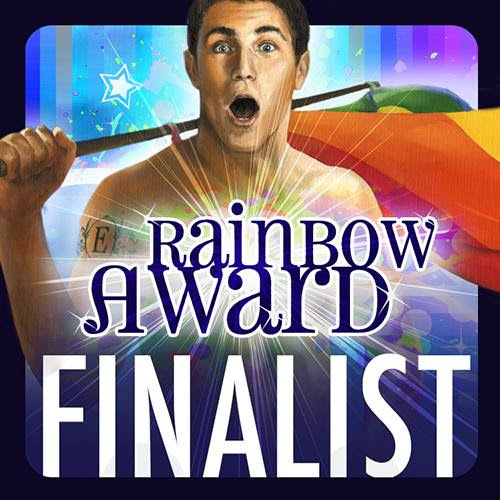 Finalist in the 2015 Rainbow Awards. 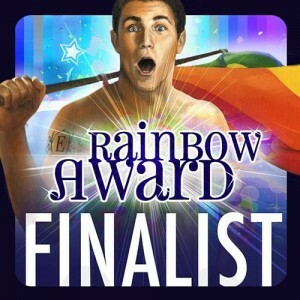 The Romance Reviews Year End Splash Party Q&A! 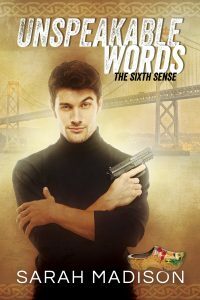 What do John and Jerry name the kitten they rescue in Unspeakable Words (Sixth Sense series Book 1)? Answer: Phoenix. Matters come to a head when Lee is hounded to turn over a mysterious artifact, of which he has no knowledge. The two men wind up in a fight for their lives as they risk everything to keep the powerful relic out of the hands of a ruthless killer. In order to protect those he loves, however, John may be forced to make a deal with the devil. Release date Oct 14, 2015. Book Three in the Sixth Sense series. 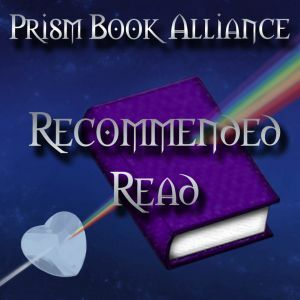 An October 2015 Recommended Read from Prism Book Alliance. Named on Prism Book Alliance’s Best Retro Reads List for 2015. On Amazon. Barnes and Noble. 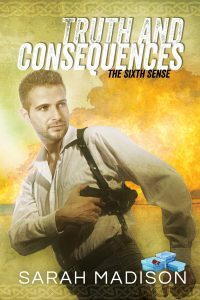 I loved the third book in the Sixth Sense series! I know it was just released, but when should I expect the next one? And how many books r u planning to write in this series? Yay! I’m so glad you’re enjoying the series! The good news is that there are at least 1-2 more stories planned–the bad news is I’m a bit of a slow writer. 😉 Hopefully, we’ll see the next installment out on 2016! I just finished Truth and Consequences. I lived the series so far. Do you have a date for the fourth book? Please tell me it will be out soon!!!!! Oh, I wish I could say it was. I asked DSP once about what goes into the decision making process on that, and they said ‘sales’. Mine aren’t there for the series, unfortunately. Sorry about the long delay to responding–the notification got lost along the way. I do have *one* book out on Audible, if you’re interested–it’s the sport horse story, Fool’s Gold. I have listened to Fool’s Gold and rated it on audible. I also requested your truth and consequences series. I can’t wait for Deal with the Devil. Have you thought about Patreon? I know most authors use facebook, but I am happy to subscribe and pay a monthly subscription to get pre-release excerpt options or even just process discussions or updates. I would love to get my friends and fellow readers agitating for your books 🙂 I bought your books initially through DSP so amazon ratings are not possible but I have rated them on goodreads. Aw, thank you, Danielle! That’s very kind of you. I have toyed with the idea of Patreon in the past, but the truth of the matter is this past year has been tough for me–so much so I’ve scarcely written a word. At this time, I feel I can’t commit to the pressure of providing new material for Patreon (though it might push me to write more, eh?). You’ve reminded me I really need to get back to Deal with the Devil. It’s been on hold for so long, I was afraid no one would be interested. Every bit of encouragement helps, though. You have no idea how much. It’s readers like you that make me determined to get back to writing again. Thank you. I do hope that you do get back to writing Deal with the Devil as I love that series. I have read them all at least 3 times each! Goodness, there’s no higher praise than that! Thank you! And I promise, I will finish. My goal is to get it out in 2019 if at all possible. Hi! I love this serie! I am brazilian, sorry my english! I read his books, even with my miserable English. And i love so much Flynn and Jerry!!!! I’m anxious for the fourth book. Hello! I read in a previous comment that you think no one would be interested in Deal with the devil! I’m absolutely shocked you think that, I’m going crazy at the thought of a Book 4 ie. crazy happy. Please please finish this series! I love the Sixth Sense series. I know that real life can interfere with writing so I just wanted to let you know that no matter how long it takes you to get Deal with the Devil out, I’ll be waiting for it. Thank you for all your hard work and pleasure you’ve brought through your writing. Oh my goodness, that brought tears to my eyes. Thank you. I promise I *will* finish it–hopefully this coming year.